A bill that would bar mental health professionals from conducting sexual orientation or gender identity conversion therapy on minors could won approval Tuesday in the Assembly. 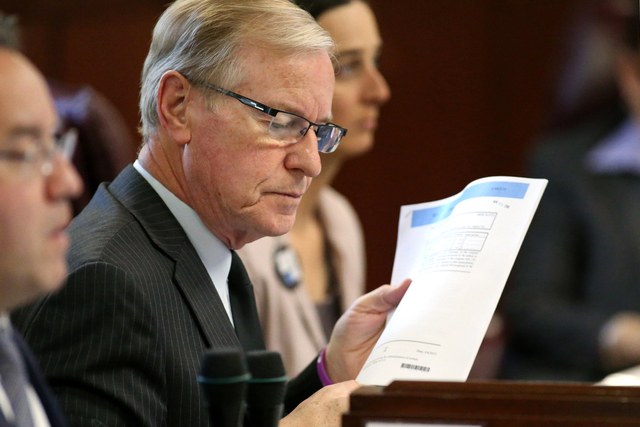 CARSON CITY — A bill that would bar mental health professionals from conducting sexual orientation or gender identity conversion therapy on minors won final approval Tuesday in the Nevada Legislature. The vote in the Assembly on Senate Bill 201, introduced by Sen. David Parks, D-Las Vegas, was 31-8. All 8 no votes were all Republican, but five GOP members were in support. An effort by Assemblyman Ira Hansen, R-Sparks, to amend the bill failed. Assemblyman Tyrone Thompson, D-North Las Vegas, called the form of therapy an inhumane practice leaving a “lifetime of negative consequences” including a higher rate of suicide. He asked lawmakers to support the measure. Chris Edwards, R-Las Vegas, also called the practice dangerous. But he said the bill is overly broad. Amendments that would have added language to protect parents, clergy, doctors and patients were suggested but not adopted, he said. Assemblywoman Jill Tolles, R-Reno, said the bill adequately protects religious speech. “The culture wars have left a great deal of damage to all sides engaged in these debates,” she said. Later Tuesday afternoon, the Senate reconvened and unanimously concurred to an amendment added by the Assembly. The Senate previously approved the bill on a bipartisan 15-5 vote. The bill now goes to Gov. Brian Sandoval. Sandoval said Tuesday he will read the details of the legislation but that he has no issue with the intent of the bill. “I am generally supportive of the bill,” he said. The Assembly amendment added on Friday includes language to strengthen the legal justification for the measure. It also added language saying there is nothing in the measure prohibiting licensed health care professionals acting in a religious capacity from counseling with such children. The measure bans the therapy, which has been denounced by major medical groups and condemned by critics as leading to anxiety, depression, substance abuse and suicide among LGBT youth exposed to it. Six states and the District of Columbia have laws prohibiting it, and several other states are considering similar legislation.